<h2>Special Offer</h2> <b>Only now</b> you can buy Chameleon Volume with a additional <b>30% discount</b>. <b>No Risk 30 Day Money Back Guarantee.</b><br> So if you like it, Please <b>hurry up</b>! Imagine if your music were to magically stop when receiving an incoming Skype call instead of scrambling round to find and stop the player yourself. This is now possible with advanced software Chameleon Volume that acts to pause your music and resume playback after the call is over. It's like having your very own intuitive DJ at home! 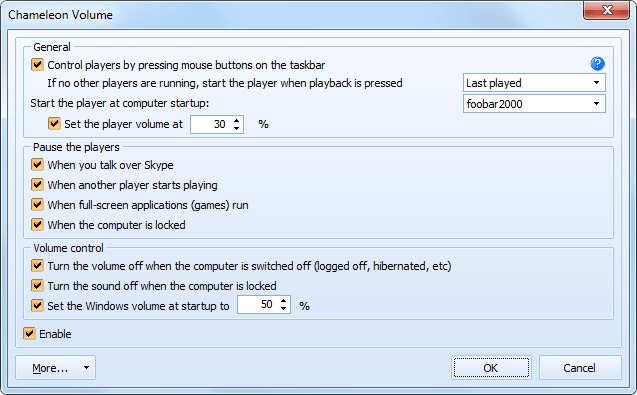 To control players, just use the mouse buttons on the taskbar: play/pause with the middle button (usually the wheel); switch to the next/previous tracks with right and left mouse buttons; rotate the wheel to increase/decrease the volume. Programs compatible with Chameleon Volume. Tell us what you'd like to see or vote for one already suggested and we'll try to add it!